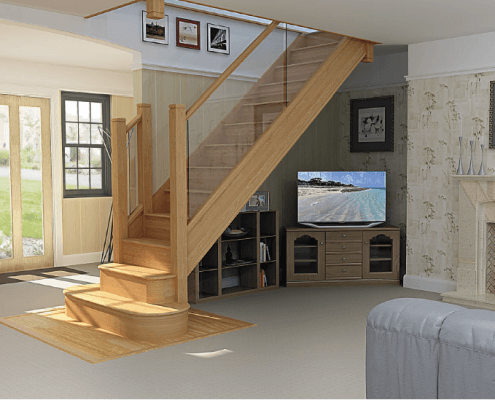 A new staircase can change the feel of the entire room and it can transform a hallway. Yet, when your staircase is located in your lounge, it becomes more important than ever to create the perfect look. The lounge is the central point of family life; it’s where we relax after a hard day’s work and spend time with our families. As such, it’s vital that the lounge is a space in which we feel happy. However, this wasn’t the case for Heather Carri and her husband, whose lounge staircase made the room look dark and didn’t utilise the space appropriately. We’ve already talked about the Jarrods Approach, but a lot of people are surprised by the amount of careful consideration goes into the design phase. 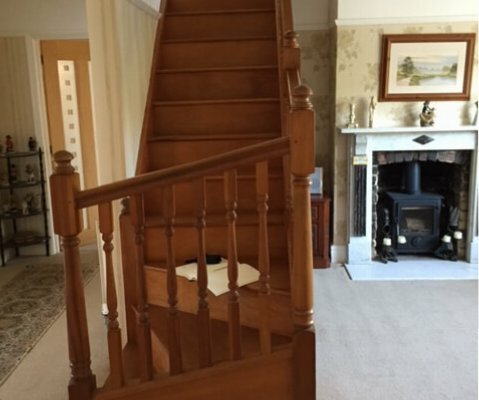 It’s not just about how the staircase looks, it’s about how it complements the rest of your home as well as the practicalities of using it on a day-to-day basis. 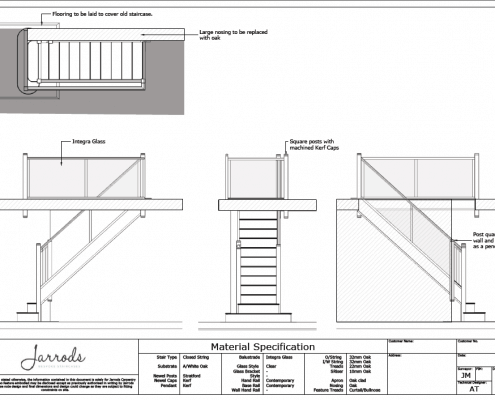 From the initial drawings and CAD mock-ups, there’s a lot that we do behind the scenes to give our customers the best idea of the final visual. 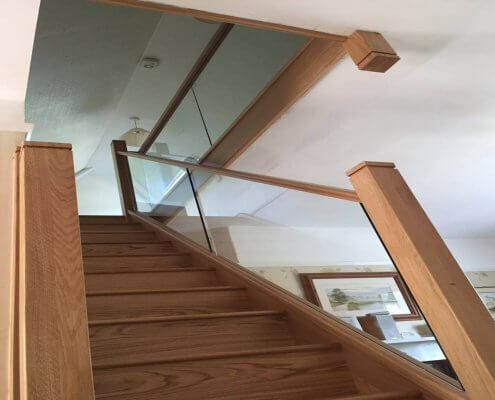 Staircase design can be a seen as a complicated process, and whilst we’ve got it down to a fine art, we appreciate that our customers benefit by having a good understanding of what they’re getting. 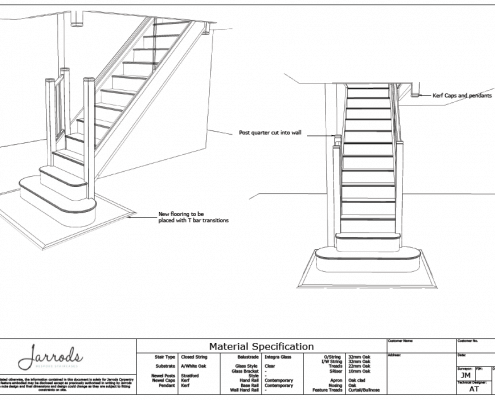 These drawings and CAD mock-ups give our customers the chance to really visualise their brand new staircase. The CAD mock-ups really helped Mr and Mrs Carri to see the full effects of what could be achieved in terms of creating extra space and light in their lounge. After meeting with the Carris, it was apparent that they wanted something more modern and light than their original dark pine. The materials of glass and white oak were chosen to breathe life into the room. The old pine spindles had made the room feel closed-in, whereas the transparency of the glass allows the room to take on a more modern and spacious feel with light flooding in. 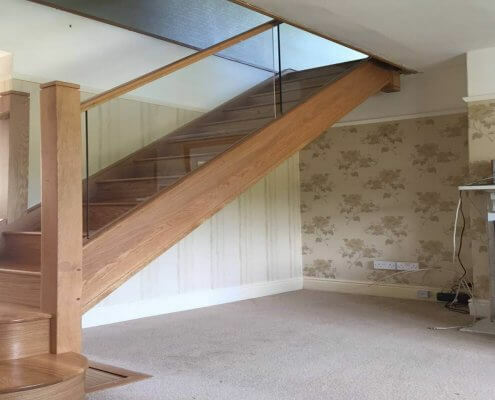 If you want to transform the look of your home with a new staircase, get in touch with our team today to discuss your options.